Weren't you being cruel enough? 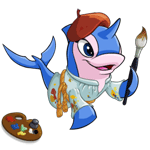 Ever since Kasey Kacheek was a baby, he had always loved the arts. He first visited the art centre at the age of five. Fascinated by the glow of the campfire dancing across the Aishas' faces, he'd listen shyly as they wove fantastic tales of mountains, beasts, and the brave Neopets who conquered them. Doctor's note: The author is still recovering.